Arterial stiffness has been shown to be an independent predictor of adverse cardiovascular events. Applanation tonometry (TONO) evaluation of pulse wave velocity (PWV) is widely accepted as the 'gold standard' method of non-invasively assessing arterial stiffness. Newer non-invasive tools such as cardiovascular magnetic resonance (CMR) have the capability to evaluate arterial stiffness, but to date have not been formally evaluated against TONO. The aim of this study was to validate CMR derived aortic distensibility with the non-invasive 'gold standard' TONO PWV as a method of assessing arterial stiffness. Twenty healthy subjects were enrolled in the study, ten young (20–30 years) and ten old (60–70 years). All subjects had TONO performed with simultaneous carotid and femoral waveform data acquired and PWV evaluated. Within an hour, patients were then evaluated by CMR (1.5 T Siemens Sonata) using ECG-gated True-FISP (fast imaging with steady state free precession) cine sequences. CMR measurements of arterial stiffness were evaluated by aortic distensibility, utilizing the equation (aortic area at end systole - aortic area at end diastole)/(brachial pulse pressure (mmHg) × aortic area at end diastole). 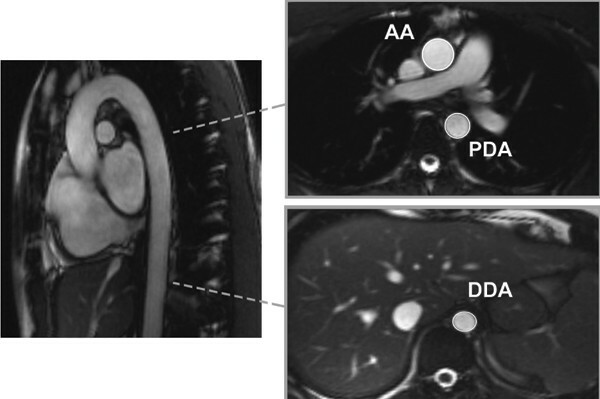 Cross-sectional areas were traced using Image Pro Plus (MediaCybernetics, Maryland) at 3 separate locations as illustrated in Figure 1; the ascending (AA), the proximal descending (PDA) aorta at the crossing of the pulmonary artery and distal descending aorta (DDA) within the first 10 cms of the aorta below the diaphragm. Statistical analysis was carried out using SPSS (v15, SPSS Inc, Chicago). Inter- and intraobserver variability were < 1%. A strong correlation between aortic distensibility and TONO PWV was observed at all three levels of the aorta (all p < 0.01). Interestingly the strength of the quadratic regression was greater than for the simple non-transformed linear regression highlighting a curvilinear relationship between these two variables. The coefficients of determination for AA, PDA and DDA were R2 = 0.531, 0.508 and 0.805 respectively. After inverse and squaring transformations the coefficients of determination were R2 = 0.381, 0.306 and 0.878. As expected the old cohort had a significant increase in arterial stiffness compared to the young cohort. A Bonferroni post-hoc comparison showed an increase in proximal stiffness in the old cohort compared to the young cohort (p = 0.023). CMR derived aortic distensibility is an accurate measure of arterial stiffness and can evaluate regional stiffness across different levels of the aorta. This process may preferentially occur in the proximal aortic segments in the elderly providing possible mechanistic links to left ventricular hypertrophy, isolated systolic hypertension and impaired coronary artery perfusion.